Like rare patches? How about one only 11 men have ever worn? The Chief Scout Executive Selection Committee announced it has chosen Wayne Brock as the next Chief Scout Executive of the Boy Scouts of America. On Sept. 1, 2012, he’ll take office and become just the 12th chief in the BSA’s 102 years. Brock, an Eagle Scout, currently serves as Deputy Chief Scout Executive/Chief Operating Officer. He began his professional Scouting career in 1972 as a district executive in New Bern, N.C., and then served on the staff in Knoxville, Tenn.
Brock also served as Scout executive in Athens, Ga.; Scout executive in Orlando, Fla.; regional director of the Southern Region; and as assistant Chief Scout Executive. Brock is a recipient of the Distinguished Eagle Scout Award, Order of the Arrow Distinguished Service Award, and received his Bachelor of Music Education degree from East Carolina University. He and his wife, Ernestine, have a grown son and one granddaughter. The Chief Scout Executive is the top paid professional in Scouting. He isn’t the most-public face of Scouting — that distinction goes to the Scouts themselves — but he serves an invaluable role in guiding the massive Scouting movement into the future. If the BSA were a corporation, the Chief Scout Executive would be our CEO. 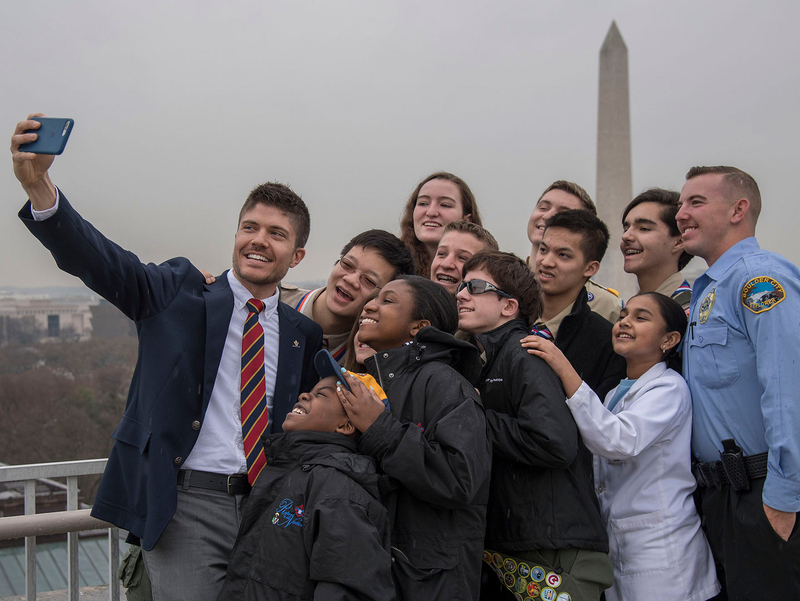 His task is to work alongside his volunteer counterpart — the National President — to lead 1,100 National Council employees, 5,800 local council employees, and almost 1.2 million adult volunteers who serve more than 2.6 million youth across the nation. The BSA already announced that another Wayne, Wayne Perry, a Silver Buffalo Award winner and member of the board of directors for the Seattle Mariners baseball team, will serve as the next National President. Perry will take over for current National President Rex Tillerson at this month’s National Annual Meeting in Orlando. Wayne Brock, Wayne Perry, and National Commissioner Tico Perez combine to make the National Key 3 — the three top national-level positions in Scouting. Robert J. Mazzuca, the 11th CSE, concludes his five-year tenure with his retirement on Aug. 31. Mazzuca, an Eagle Scout, a native of San Juan Bautista, Calif., and a graduate of California Polytechnic State University, served as a BSA professional for more than 40 years. Bob began his Scouting career in 1971 in Modesto, Calif., as a district executive and Exploring executive. He became the Exploring director in Sacramento in 1975 and served as a field director and director of field service. In 1983, Bob became Scout executive in Stockton, Calif. In 1987, he advanced to become an area director in the Western Region. He was promoted to Scout executive of the Golden Empire Council in Sacramento in 1988. In 1992, he was named assistant regional director for the Southern Region, and in 1995, Scout executive in Pittsburgh, Pa. In 2005, he was appointed national director, Development Group, and in 2006, he became assistant Chief Scout Executive. A year later, he was named Chief. Many thanks to Mr. Mazzuca for the decades he spent guiding this movement we all love. And my hearty congratulations to Mr. Brock as he leads us into the future! 1960–1967, Joseph A. Brunton Jr.